I'm have to bid a reluctant farewell to mainland Greece today. There's a lot more still to see, but I'm rapidly running out of time to visiting Europe. I have to get up at a shocking 6 in the morning to catch a bus to Athens for a flight. Heraklion (or Iraklio) on the island of Crete is my next destination. The bus I have to catch leaves at 7. The journey to Athens should take 2 hours, then factor in another 30 minutes for the train from Athens to the airport gives me plenty of time for the 1235 flight out. When the bus gets into Athens, I realised that instead of going all the way to the terminal station, I could just get off when the bus stopped near the a metro station. The big hint being people with lots of luggage and obviously heading to the airport started getting off. I've arrive at Athens with plenty of time to spare, so I could have caught a later bus (there are hourly buses from Nafplio). At least I'm not late. It's very quiet in Heraklion Airport upon arrival. Not the most modern airport in the world. It's obviously a very old airport. Small, dark, gloomy, and in dire need of some modernisation. There's no air con the check-in area which is so small, I can visualise the queues extending into the airport entry and exits during busy periods. I've failed to do research on how to get to my hotel in the city and can't find an information at the airport, I feel compelled to get a taxi. There's a taxi stand just outside the airport entrance. The taxis all have a €10 fixed price fee into Heraklion city proper, which seems excessive. It's about 2.30 when I'm done checking into the hotel and ready to go out. THe hotel staff provide the usual map of the city, some information about transportation, and crucially the opening time of the Knossos archaeological site. The palace of Minos does not close until 8 in the evening. Not wanting to make the same mistake as in Olympia, I decided to visit the site today. There are direct buses to Knossos from the centre of Heraklion, just outside the cinema. Unfortunately, the centre of Heraklion is a 20 minute walk from the hotel, in 37c heat. I'm parched by the time I reach the bus stop. There are several kiosks cleverly located around the bus stop. I need to get a drink, 3 bottles in fact. The world weary vendor also offers to sell me tickets for the bus, which was just as well because there's no bus tickets machines. Getting at the right place isn't too difficult. The bus drops people off at the entrance to the archaeological site. Plus, the rows of tourist shops opposite the entrance is also a big hint. The Palace of Knossos is the largest bronze age site in Crete. The centre of the Minoan civilisation and culture. The ancient Minoan civilisation has many similarities with the contemporary Mycenaean civilisation. The latter eventually conquering, or as some speculate took over after some disaster befell the Minoans. 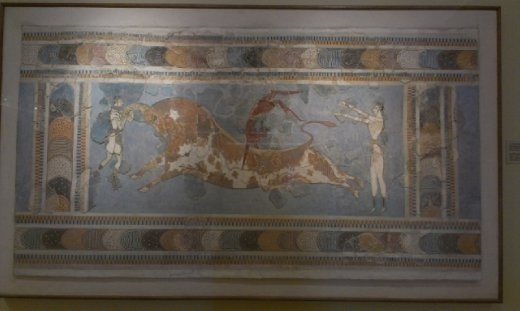 Much of Minoans is speculation. It was here in Knossos where the oldest known palace in Europe was found. Even the idea that the site is a Palace complex is disputable as it has no fortifications nor stores for weapons. The ruins of a site is collection of workrooms, store room, huge number of rooms and living spaces (speculated to account for the myth of the Labyrinth ). On some of the ruins, there are still some fresco copies on the walls that reflect that of Cretan life in the bronze age. It's easy to be fooled by the good state of preservation of the site. The main discoverer of the site was Arthur Evans. His approach to Knossos was reconstruction. I don't have anything against reconstruction per se. There's a fine line between visualising the ancient sire and preserving the original character and structures of the site. After 2 hours exploring the site, it would take more courage than I have to ask for my money back. Still, it's work a visit. After this, it's already about 7. Been up for 13 hours and really need to get some sleep.